In 2016 the CEO of Ananas Anam and founder of PiñatexTM, Dr. Carmen Hijosa told me during a skype call, that the PiñaBook Cases are the first available cases in the world, made with PiñatexTM. Thank you for that amazing possibility. For now, available cases in the shop are the last ones. 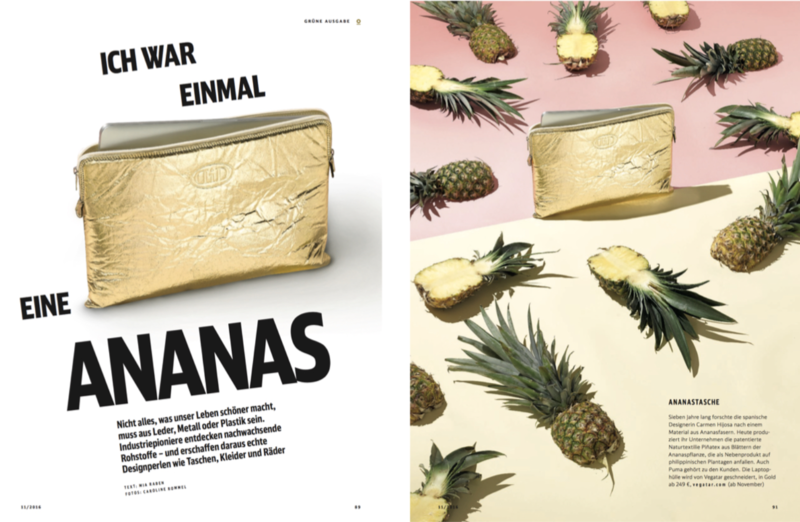 Especially the gold pineapple material was a very beautiful and limited production by Ananas Anam and is no longer available. The lining for golden PiñaBooks is very soft, handsome and CO2-Neutral by Alcantara. A perfect combination for all vegan fashion pionieers. or as organiser for DIN A4 documents. In 2013 Vegatar was nominated for “best accessoires men” by PETA Germany. The material was made in Germany and a special developement based on eucalyptusfibre. Since 2013 more and more colors have been taken out of the assortment. The following bags are the last ones and truly unique in the evolution of sustainable fashion. Only 1 V-Pad in Black available! Nur noch ein Exemplar auf Lager! or as organiser for DIN A5 documents. Only 1 V-Book in Black available! ONLY 1 Daisy Vintage available! ONLY 1 Zooey – Baby Blue available! Nur das eine Set erhältlich! The perfect organiser, especially for your handbags.